Now we finally know where “conflict minerals” coltan and cassiterite, essential to the electronics industries, go after being smuggled out of the Democratic Republic of Congo to Rwanda – and from there to who knows where. No one really knows because coltan and cassiterite refiners and electronics manufacturers all assure us that they never buy conflict minerals, even though most of the world’s coltan reserves and much of its cassiterite reserves lie in conflict torn D.R. Congo’s North Kivu Province. But at least we know where a lot of coltan and cassiterite go, in the end. They go to Ghana and other parts of Africa as toxic electronic waste, often disguised as charity: European and North American “contributions” of worn-out, broken, no longer fashionable tech garbage. This demonstrates how homicidally Europeans still behave in Africa, including even many from nations like the Netherlands, which seems relatively benign, when compared to the U.S., which continues to expand Africom, the U.S. Africa Command, a chain of U.S. military bases commanded by U.S. Army Gen. William “Kip” Ward, in Africa. The Netherlands joined Sweden in ending foreign aid to Rwandan President Paul Kagame’s regime, because of human rights violations and war crimes in both Rwanda and neighboring D.R. Congo. The Netherlands is, nevertheless, on Greenpeace’s list of European nations shipping and dumping toxic e-waste “charity” in Ghana. Isn’t this an international crime more serious than Somali “piracy,” a response to nuclear waste dumping on one end of the Somali coast and to European trawlers fishing out Somali waters, which Somali fishing communities depended on, on Somali’s other coast? 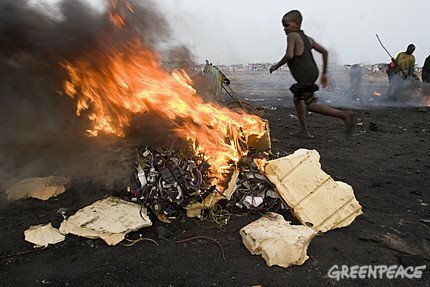 Shouldn’t the same Netherlands politicians who canceled aid to Rwandan President Paul Kagame take the lead in stopping the shipment of toxic Euro e-waste to Ghana and elsewhere in Africa or any other African nation? And shouldn’t President Barack Obama either follow that lead or take it himself? Ann Garrison is a Bay Area journalist and activist and the website writer-editor of thepriceofuranium.com. She can be reached at anniegarrison@thepriceofuranium.com. This story was first published by Colored Opinions. As a Dutch person I say: what a shame… Thanks for sharing this. I’m so glad that a Dutch person responded. I wrote this first for a Netherlands-based blog, coloredopinions.blogspot.com, which I contribute to. Its creator, H. Vincent Harris, is very knowledgeable about Africa, because he does immigration work there. Somali Piracy: Piracy is a deplorable act. However, the news media invariably omits some important background information. Consider, since the collapse of the Somalia government in 1991, foreign trawlers and vessels have been overfishing Somali territorial waters and at the same time dumping toxic waste, including nuclear waste, into its waters. These foreign vessels are from all of southern Europe, France, Spain, Greece, the United Kingdom, Russia, China, and Norway. Somalia has become a free-for-all coast for dumping toxic waste. Somalia complained to the United Nations and the European Union, but were ignored. Who is going to listen to a poor, unstable African country? Somalia tried to chase these fishing “pirates” away, but they returned with navy escorts. Their must come a day when the Afrikan continent say’s no to this rampant destruction of our ancestral continent. Somali government has collapse. many Afrikan government are still intact so why continue to allow this madness that will devastate the health and wellbeing of the future generations and the continent itself? at what point do we say no to European nations and their imperialistic, parasitic, capitalistic and destructive ways. they are at war with nature, the planet and themselves. at what point do we separate ourselves from their cancerous ways? Interesting post !! and it is informative too! ! !